For cheese lovers, a fine cheese board is essential at all tables, it is the perfect apetizer. But, what if it was possible to slice and serve in the same board? With Froma that is possible. 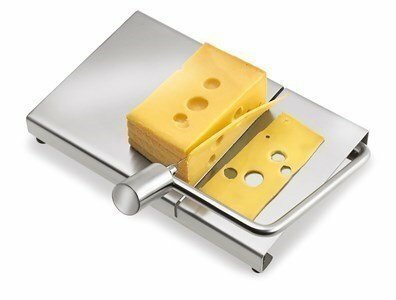 This amazing cheese slicer makes it possible to serve your favourite cheese on the spot!!! Say goodbye to the conventional cheese knives that do not always slice cheese properly! Froma is perfect on a dining-table or on a graden table for an after-hour snack. With a modern, contemporary design, Froma is a must-have for cheese-lovers. In stainless steel, it includes 2 substitute wires. As soon as we discovered the Spicy Vanilla, we challenged Cinthia to explore store.inexistencia.com and introduce the store in her world of reviews.